When an engine has low compression is will be due to a handful of reasons which will be explained in the following guide. If no compression is present in any one cylinder it means a mechanical malfunction has occurred while low compression could just be the sign of worn internal engine parts. 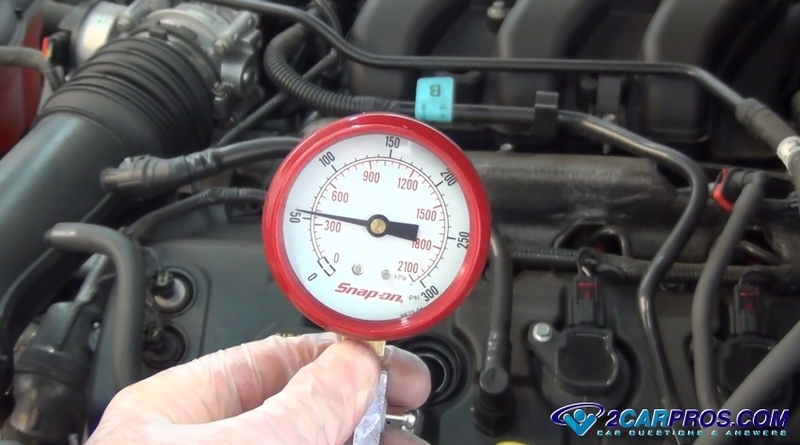 Checking compression is done using a simple compression gauge and can be done in about 45 minutes in most cases. An engine with low compression in one cylinder will present itself by having a misfire and running rough while no compression in all cylinders will cause the engine not to start. There are many different low compression symptoms which will cause the engine to run abnormally. We have listed four different low compression and no compression examples and the causes for each. 1. 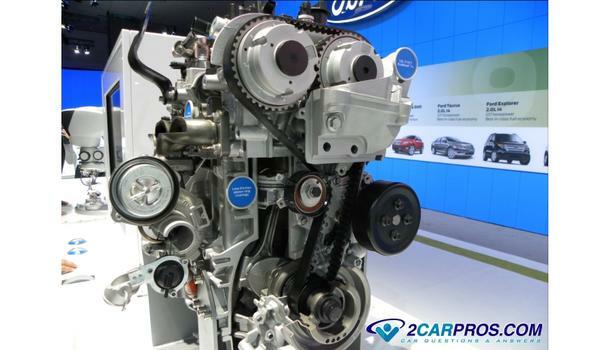 Broken Timing Belt or Chain: Every car engine needs a timing belt or chain to keep the camshaft in correlation with the crankshaft. When these parts fail the camshaft stops turning which causes the intake and exhaust valve not to open and close. Without the camshaft rotating the engine cannot make compression and timing belt or chain must be replaced. In the example below there is timing belt which is made of rubber and will usually fail at about 110,000 miles. 2. Broken Camshaft: If a camshaft breaks at the forward most journal it will stop the camshaft from turning much like a broken timing belt or chain. This is a rare occurrence but it does happen and when it does the camshaft must be replaced. 3. Worn Piston Rings: Each piston has a set of rings that help seal the piston to the cylinder walls. These rings include a top ring that handles most of the sealing, a secondary ring that help catch what the first ring misses and an oil control ring that helps wipe anyway engine oil which is splashed onto the cylinder walls while the engine is running. As miles are put on an engine these rings will wear at a common rate between all cylinders and fail about the same time which is a sign that the engine is worn out and the rings will need replacement. 4. 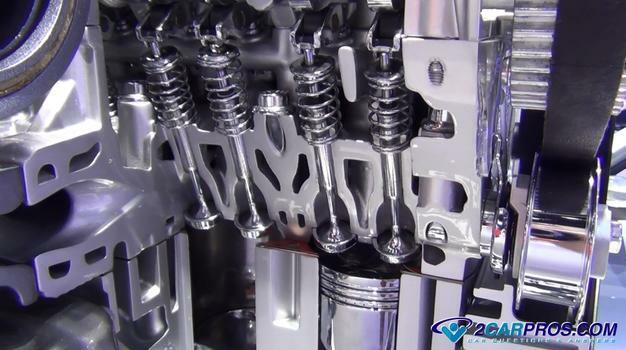 Bad Intake or Exhaust Valve: Intake and exhaust valves are present in every combustion chamber in the engine's cylinder head. The valves seal against a valve seat which is pressed into the cylinder head. Each of these pieces is made of a hardened metal that are finally ground to create the seal. After time and usage this seal can become worn and burnt creating leakage which allows the compression to escape. In this case the cylinder head must be removed and a valve job performed. 5. 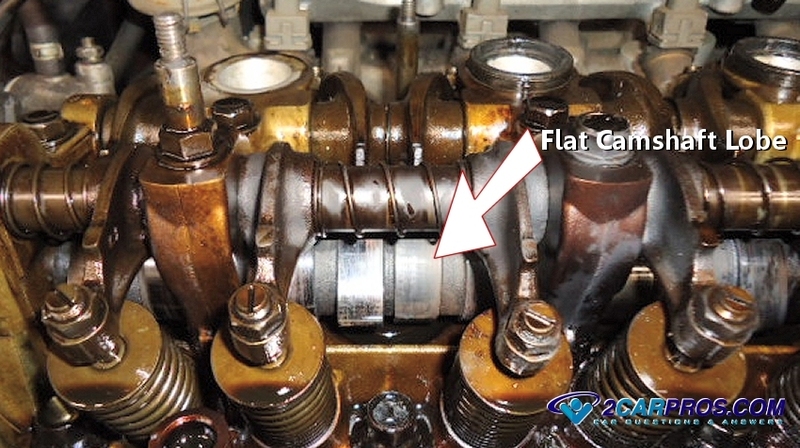 Flat Camshaft: The camshaft is responsible for opening the intake and exhaust valves. This is done by the camshaft lobe, one for every valve. When this lobe wears down it will not open the valve which will not allow the cylinder to take in air or allow exhaust gasses out of the cylinder resulting in low compression. 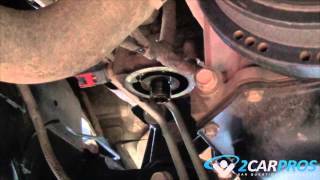 This can be observed by removing the valve cover and turning the engine over to check the valve movement. When this problem occurs the camshaft must replaced. 6. Broken Piston Ring: If a particular cylinder piston ring breaks it will allow cylinder compression to leak outward into the crankcase. 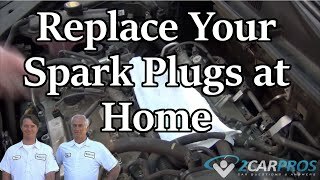 To check for this condition remove the oil fill cap when the engine is running and you will see a distinctive pulse of smoke forced outward from the inside of the engine. A compression test will be able to pinpoint which cylinder has malfunctioned and needs repair. 7. Blown Head Gasket: A head gasket is used to seal the cylinder head to the engine block. When this head gasket fails it can do so between two cylinders and will allow compression to leak creating equally low compression in each. A compression test will be able to detect this failure. 8. 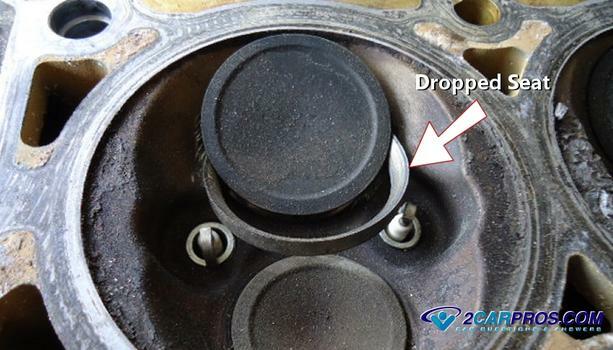 Dropped Valve Seat: A valve seat is a super hard metal ring that is pressed into the cylinder head. Most cylinders heads are made of aluminum and expand from heat at a different rate compared to the metal valve seat. This variance in expansion rate can cause the seat to fall out of the head. Once this has occurred the cylinder will have no compression as the air escapes into the valve port. Once detected the cylinder head must removed and replaced or repaired. 9. Broken Valve Spring: A valve spring is responsible for closing the intake and exhaust valves once the camshaft has opened them. These springs are made of high tension steel which can become brittle and break allowing the valve to hang open which will allow the compression to leak out. When a compression test reveals a cylinder with no compression the valve cover must be removed and the valve spring inspected for this failure. 10. Dropped Valve: A valve retainer set which is two half moon pieces of metal that lock into the valve spring retainer and are designed to hold the valve to the valve spring. If these pieces become dislodged they can fly out of the retainer and allow the valve to drop into the cylinder contacting the piston. When this occurs the head must be removed and the cylinder inspected for damage and then repaired. 11. Broken Valve: An intake or exhaust valve is constructed into two parts, the stem and the head. The stem protrudes through the cylinder head and connects to the valve spring while the head of the valve seals against the valve seat. When these valve parts fall apart the head will drop from the stem and allow compression to leak from the cylinder while causing extreme damage to the piston and cylinder head. 12. Piston Hole: A piston is made of a cast or forged aluminum alloy which is designed to withstand the forces of combustion. In some cases this aluminum will have a weak or thin spot which can create a hole in the piston allowing the compression to leak into the engine's crankcase. 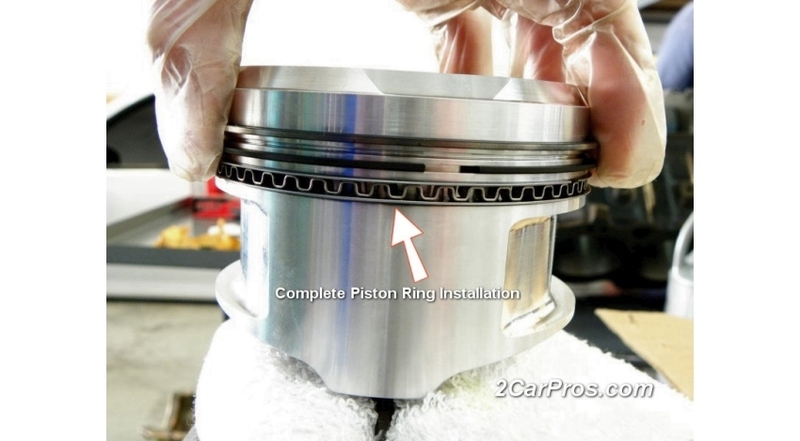 You can check for this condition in the same way you would check for broken piston ring which is motioned above.